This form records an agreement between the contractor and the subcontractor. From your project page, go to Pre-Construction > NSW Contracts > Create > Subcontractor Agreement > Subcontractor Agreement Lump Sum. 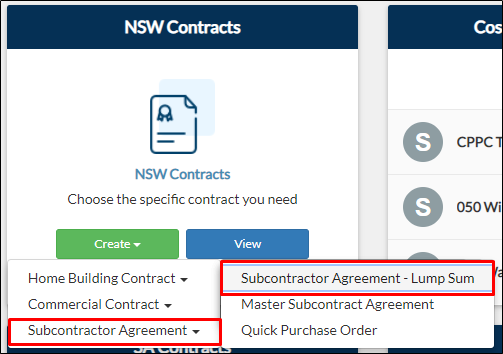 From your navigation bar, go to Pre-Construction Phase > NSW Contracts > Subcontractor Agreement > Subcontractor Agreement - Lump Sum. Or type in Subcontractor Agreement - Lump Sum on the search bar located on the upper right corner of your portal. 2. You will be directed to the Lump Sum Subcontractor Agreement page. 3. Fill out the fields especially the Insurances and Contract Price tables.